I haven't posted a picture of one of my babies in awhile and thought I would share another one from the past. I then will get photo's of my Rik Pierce house to show you haw far I have come with it. I still have some work to do on it as I haven't had the chance to do a thing since the class other than gather(my favorite thing to do) all of the paint,glue, etc. needed to complete the job! 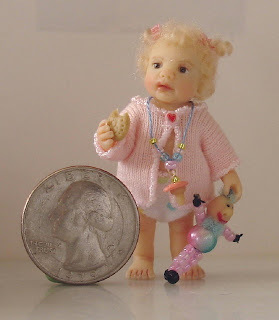 I hand sculpted the biscuit,pacifier and the little bead toy that Eliza is holding. Impresionante muñeca e impresionante trabajo. Me encanta. Es preciosa y muy dulce. Es una delicia! tan tierna con su muñeco y su galletita! Catherine, Thank you for your sweet comment!! Muchas gracias por los comentarios mis queridos amigos! Significan mucho para mí! I'm looking forward to seeing your Rik Pierce house too, but I always enjoy looking at your itty bitty baby dolls. Thank you for all of the sweet comments everyone!! They mean so much and inspire me to do more!! Patty que bebita tan linda!! el conjunto es encantador, con su galleta y todo... felicidades!!! Patty, me habia perdido a esta preciosidad de niña. Te ha quedado tan dulce!!! !